We propose a new family of inexact sequential quadratic approximation (SQA) methods, which we call the inexact regularized proximal Newton (IRPN) method, for minimizing the sum of two closed proper convex functions, one of which is smooth and the other is possibly non-smooth. Our proposed method features strong convergence guarantees even when applied to problems with degenerate solutions while allowing the inner minimization to be solved inexactly. 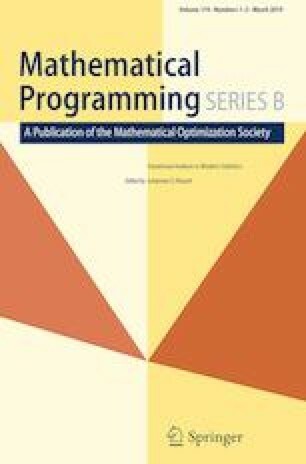 Specifically, we prove that when the problem possesses the so-called Luo–Tseng error bound (EB) property, IRPN converges globally to an optimal solution, and the local convergence rate of the sequence of iterates generated by IRPN is linear, superlinear, or even quadratic, depending on the choice of parameters of the algorithm. Prior to this work, such EB property has been extensively used to establish the linear convergence of various first-order methods. However, to the best of our knowledge, this work is the first to use the Luo–Tseng EB property to establish the superlinear convergence of SQA-type methods for non-smooth convex minimization. As a consequence of our result, IRPN is capable of solving regularized regression or classification problems under the high-dimensional setting with provable convergence guarantees. We compare our proposed IRPN with several empirically efficient algorithms by applying them to the \(\ell _1\)-regularized logistic regression problem. Experiment results show the competitiveness of our proposed method. This research is supported in part by the Hong Kong Research Grants Council (RGC) General Research Fund (GRF) Projects CUHK 14206814 and CUHK 14208117 and in part by a gift grant from Microsoft Research Asia. We thank the anonymous reviewers for their detailed and helpful comments. Most of the work of the first and second authors was done when they were Ph.D. students at the Department of Systems Engineering and Engineering Management of The Chinese University of Hong Kong.